It is almost the weekend Yay! I love the weekends, who doesnt? Haha I just love being able to sleep in on Saturday’s mine and Jordan’s work schedule is pretty demanding so we don’t really get to chill until Saturday so we really take advantage of having a lazy Saturday together, emphasis on the lazy LOL This is a typical lazy Saturday look for me when we go out to brunch, because lets be serious we don’t wake up in time for breakfast. A cute but functional outfit to be out in about it. My cute friend/photographer let me borrow her super cute shoes for this shoot because typical space cadet Jenessa forgot her shoes again and didnt realize it until we got to our location haha I am so comfortable being barefoot that sometimes I forget it is socially frowned upon to not wear shoes and I totally forget to grab them on my way out the door! Anywho, hope you have a great weekend and thanks for stopping by! P.S. GET 30% OFF AT JCREW BY USING CODE: TIMETOSHOP at check out. Enjoy! My Picks below! great look, especially love that chunky necklace! Posts online about Rome, Tahiti, Egypt, San Francisco, London…. Love stripes & white jeans!!! So easy but looks so put together!!! Have a good weekend:)! You looks fantastic! Love your hair style so much! Such a cute J Crew top! Have a great weekend! You look great here! 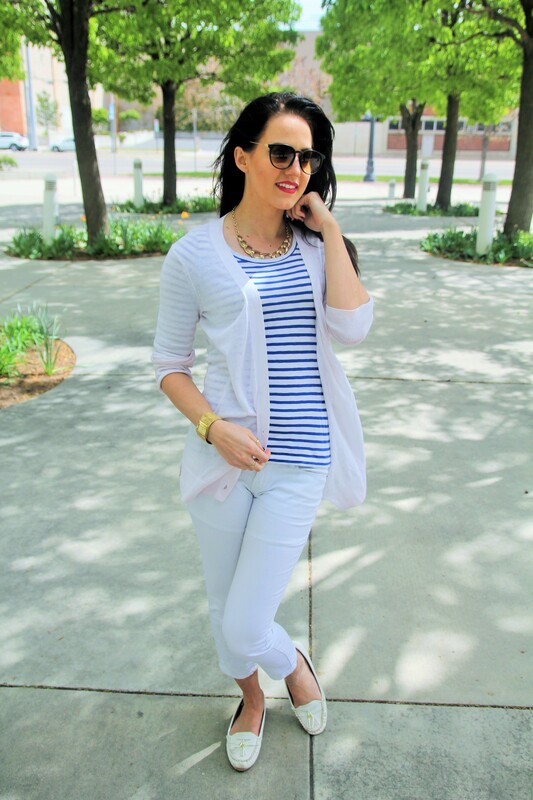 Love the classic stripes with white pants look! I love this look! Simple but so chic!! You look great! Wat een leuke outfit! Je eyeliner is echt prachtig, wauw! Such a cute white look! The stripes are the perfect pop of color and pattern for this casual look. Love this outfit! It’s so crisp. The stripes are perfect, and I love your makeup! Thanks hon! You are so sweet, have a great weekend. Love this outfit! I feel like you can never go wrong with stripes, one of my favorite crop tops is very similar to the top you’re wearing! Hi Jenessa! Thank you for stopping by my blog and your lovely comment! Your style is beautiful and i love your hair and make-up! Awe girl you are too kind! haha dont worry I got what you meant! Awe so sweet thank you Kitty! I love stripes and you did it justice. Loving the leg chains too. Have a fab weekend. 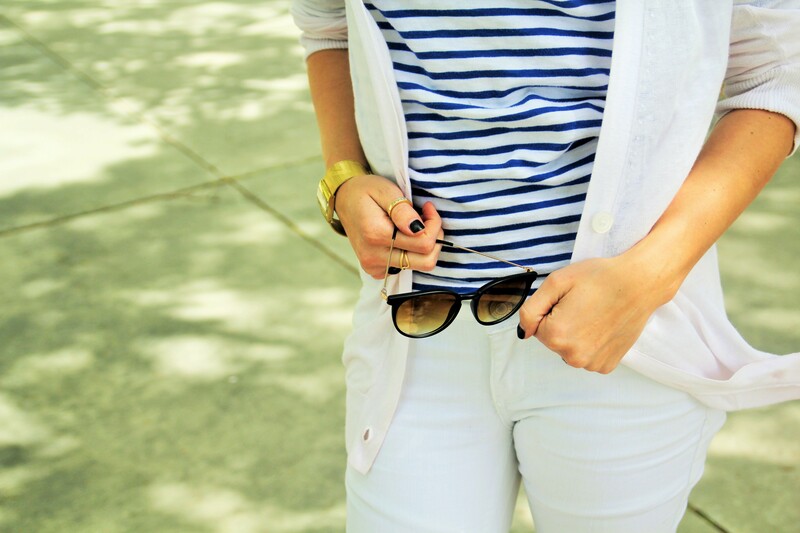 The white and Stripes combo Is simply Perfect! It’s a fav of mine too! Love this look, it’s so great for the summer. 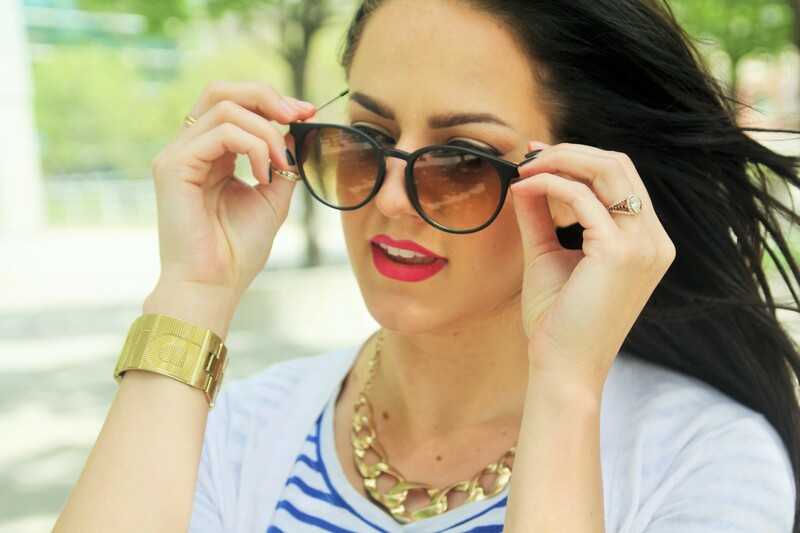 Nautical with a glam edge! Thank you Lena! I couldn’t agree with you more! I love stripes for that very reason! This is a sharp and classy look on you. I love the all white with stripes. It’s so refreshing and perfect for Spring! Thank you bry! I’m a lil obsessed with all white these days! Stripes are your thing! You look awesome! Those jewelry are stunning! I love how it complements to your whole outfit. I also adore the sunnies and the shoes! I meant U look beautiful ~~~ hate auto typing sometimes.. Good nite. You look gorg in these photos:) Stripes and white are so classic for spring!